The iPhone 6s Plus was said to launch up to 40 percent faster, with the keyboard said to display up to 50 percent quicker, and a 70 percent faster shift to the camera. Under load, the same iPhone was claimed to launch apps twice as fast. Additionally, the CPU ramp-speed is increasing across not just older devices, but also the newer ones as well, meaning improvements will also be visible in Apple's current-generation of devices. The iPhone 6s, cited by Apple in the keynote speech, will be three years old when iOS 12 releases, and certainly qualifies as an older iPhone that is still supported by iOS 12. With that said, a lot of us are Apple enthusiasts that use newer devices like the iPhone 8 and iPhone X. To get a baseline on more modern hardware, we decided to pit Apple's iPhone X flagship running iOS 11 against another iPhone X with the first developer beta of iOS 12 installed, and looked for any performance improvements between the two smartphones. Just from simply turning on both phones, it was noted iOS 11 started up quite a bit faster than iOS 12. Once up and running, we moved on to Geekbench 4 with all other apps closed. The benchmark tool launched on both iPhones at the exact same time. Benchmark scores have the potential to improve with incremental iOS updates, due to code optimizations implemented over time, so we were surprised to see that the results came in incredibly close. Running the GPU test, there was a distinct improvement of over 20 percent when testing out Metal. Moving on to our suite of apps, we started off with a variety of games. Fortnite launched slightly faster on iOS 12, but the difference isn't that notable. Pokemon Go launched more than a second faster in iOS 12, while Vainglory improved its launch time by over two seconds. Running native apps, the launch speed for News was fairly similar across both phones, with the same experience found with Stocks, Voice Memos, and iBooks. The time it took to launch Zillow was close between the two devices, and our own AppleInsider app was slightly faster to get running on iOS 12. Amazon Prime Video was two seconds faster on iOS 11, while the speed of firing up Google Drive was roughly the same. Testing a few more native apps, TV launched almost instantly on iOS 12, while it took three seconds in iOS 11. Maps also started slightly faster with iOS 12, and Photos was about the same speed on both. We then wanted to test RAM management, so we re-launched each app to see if iOS 12 would keep more apps running in the background. It turns out both OS versions kept each app in the background and launched them just as quickly, suggesting there to be little difference between the two in this area. So far, we're really impressed with iOS 12. Not only is it quicker in many apps, but we're also seeing an improvement in apps that take advantage of Metal. Typically when Apple releases a beta of an upcoming iOS release, it's initially slower, but gets faster when the full version is released to the public. It's great to see the first developer preview working so quickly, and we're excited to see iOS 12 launch this fall. 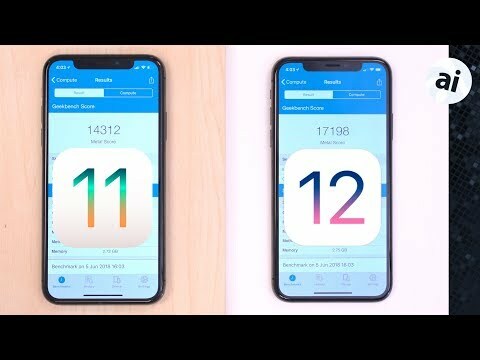 AppleInsider is also working on a speed comparison between iOS 11 and iOS 12 using the iPhone 6 and iPad mini 2, which should give users of older iOS devices an idea of what to expect in the future. Given 5S is the lowest supported hardware yet all the data shown was for the 6 anyway. Why not a 5S test? Forget the iPhone X. That's a lame, dumb test. How about something older, like the iPhone 6 I'm using!!! That can be dog slow at times. Keyboard slow to pop up, etc. A real test on OLD hardware. You know where faster speed and performance would really matter. With iOS 12 claiming speed improvements, I find this sentence in the article to be odd. Odd that there was no commentary about that unexpected result. Guessing prefetch and initial caching is the reason, maybe a few reboot would make it different. Though, people tend to leave their phone ons all the time, so that initial load is a quite rare event (in my case, the phone can stay months without being shut down). THE BATTERY LEVELS ON THE PHONES IN YOUR TEST IS TOTALLY DIFFERENT -- The iOS 12 phone has a nearly full battery. The 11.4 phone battery is nearing empty... Please re-do as an apples-to-apples comparison with both batteries full? Me as well. Stop that 11 v 12 madness. Everyone will upgrade as 12 will be very polished and faster. If you read carefully Apple say faster under load. Means you will see difference more when phone is busy doing other things in background. YouTube is full of speed comparisons of 11 v 12 even on 5s but no test against iOS 10!!!! Those users are not sure whether upgrade not iOS 11 users. This could be the first Operating System I’ve ever used that is billed as faster and actually is! Codes optimizations for newest models mean code de-optimization for all older models. FTA: "AppleInsider is also working on a speed comparison between iOS 11 and iOS 12 using the iPhone 6 and iPad mini 2, which should give users of older iOS devices an idea of what to expect in the future." Yeh, I've seen that same error in a couple of AI articles and they not only don't correct it, they repeat it. It makes me wonder if Craig was incorrect when he spoke? Did he mean to say 6S Plus instead of 6 Plus? I find that betas tend to start up slower. They do, as the article says, get faster over the lifetime of the beta. We've been told at WWDC that these gains are on the 6S Plus. I'll send some emails today and make some calls to get some clarity on the subject. iAppleBytes on Youtube has a test on a 5s and a 8 at least (if not even a 7 and a 6s), between 11.4 and 12.0.b1 - the 5s which is now, what?, almost 5 years old, seems to get a new life. Back in the day when I switched from Windows to Mac with the first Mac mini (still the PowerPC version) I remember Apple was managing to improve speed and boot times with new features on the same hardware. After a while, all new OS X/Mac OS versions tend to be more like Windows - either the same speed or slower and same or more RAM requirements. With not any real visual marked difference. When everything stays the same between 2 releases, it is almost a miracle nowadays. So I hope this iOS 12 marks a come back for Apple to provide lean, fast, smart software - bug free and that it just works, for all its platforms, not just iOS (i.e. MacOS....). Anybody know of somebody out there on Youtube doing this kind of tests? As previous comments, I'd love to see a comparison between iOS 10 and 12 on the iPhone 6. I never upgraded to iOS 11 because of it obviously made the device noticeably slower, but I'd give it a try if you guys do compare it. I don't care about the new features as much a speed/usability, but security is always important on these updates. Good video, by the way. I was wondering... AI doesn't tend to make mistakes. Not very often anyway. So I even went back and listened to that part of the keynote again and I heard him say "6 Plus". For me it's important because I have a 6 Plus -- and my only problem with it is speed. If iOS12 resolves that I might put some money into ita to nurse it along a bit longer... But, as I remember, the 6S received a significantly stronger processor, so it just might see substantially more benefit from the tweaks they've made than the 6. As it is, each morning I tell it: "Come on baby -- hang on for another 90 days and you can retire in style! with a nice pension and just play music all day!" He did say 6 plus and it does load faster on the 6 plus as I have the beta on here now. Not sure about 40 percent, though. Camera is way faster for sure. Installed on an iPad Mini 4 yesterday, everything is noticeably faster and smoother as advertised. iTunes Remote crashes, had a random Safari crash... actually the crashes kind of feel fast too! Regardless I’ll install on my phone once it’s in public beta.